Christ The Bridegroom: Mothers...Fathers...and work day volunteers! First of all, Happy Mother's Day to our dear Mother Theodora!...and to all of our mothers! You have nurtured us with the love of God! Secondly, we also honor our fathers today...well, our Fathers of the First Eccumenical Council (Nicea)! On this Sunday after the Ascension, the Eastern Church honors these Fathers who defended the basic truth of our faith that Jesus Christ is fully God and fully man (the Arian heresy denied this truth). These Fathers include saints like St. Nicholas and St. Athanasius. We owe to them our gratitute for the Symbol of Faith (creed) that we profess at every Divine Liturgy. And lastly, but not least of all, we want to thank all of our awesome volunteers who came out yesterday, even in the damp, chilly weather, to offer their time and talents to help us with many projects in and around the monastery. At least 60 people joined us! All of the many children who came were great workers! 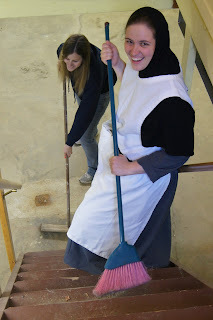 Click on the photo of Sr. Gabriella to see more photos from the work day and cookout!